Battle Hardened Tackles the Temple! Battle Hardened stepped back in time this week for the Black Temple Timewalking event. 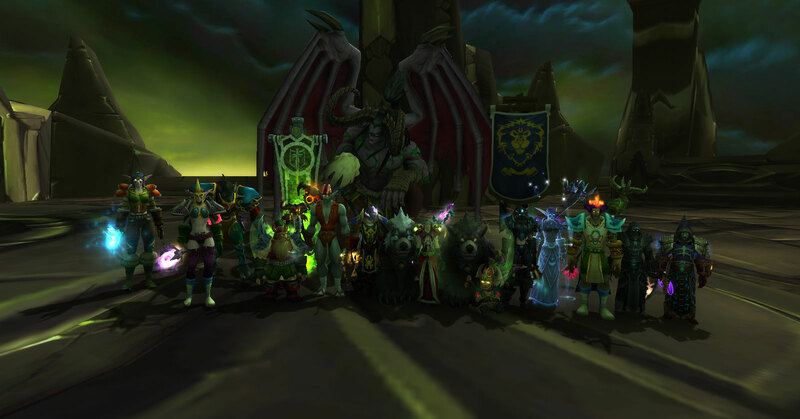 In true BC fashion, everyone made sure to wear their mismatched old-world transmogs and turned on the old character models in the game settings before running inside to get perma-rooted for trash. Illidan was even kind enough to pose for a picture with the group before we kicked the snot out of him and handed him over to his lady love, Maiev. Overall we had a blast reliving (and relearning) some of the boss mechanics that are routinely ignored in transmog runs, though I think we're all pretty pleased with a few of the directions WoW has gone since then (like fixing tank threat so we don't have to have two sunders before everyone else can even look at the boss)!